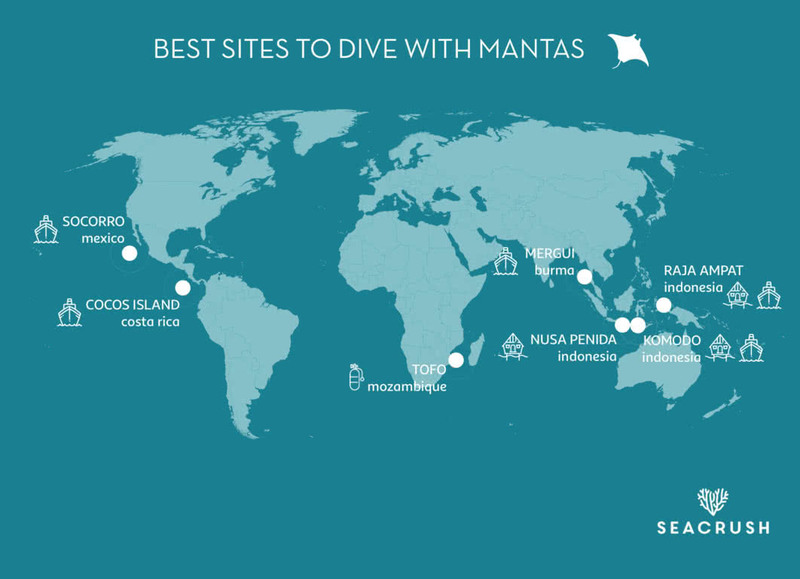 Manta Ray Travel Guide: When to Go, How to Get There, and Who to Dive With! Seeing mantas underwater is mesmerizing. Not only are they beautiful to watch, they’re incredibly intelligent - their brains are larger than any other fish. Mantas are social creatures and are often found feeding in groups, soaring through the water behind one another as they feed on plankton. They are a must-see for any diver. We reveal some of the best destinations to see manta rays, ranging from the most economical to the most exclusive. You will know when to go, how to get there, and who to dive with! Dive trips range from 550 USD to more than 5,000 USD, catering to every diver’s budget and holiday style. Our recommended dive operators have been hand-picked for their knowledge of the sites, professionalism, and their positive impact on toward marine conservation. It’s no wonder Marine Megafauna Foundation established its first base in Tofo to study mantas and whale sharks. The local upwelling phenomenon brings a lot of plankton, attracting these majestic filter-feeding creatures. How to Get There: pretty much everyone arrives from the south via Maputo (the capital of Mozambique). Then, either take a transfer by minivan (6-8 hrs) or a local flight to Inhambane which is a half-hour drive from Tofo. Nusa Penida has two sites where mantas are seen on almost a daily basis. One of the sites is accessible for snorkeling, but divers will enjoy the manta cleaning station where they’ll have their skin, gills and teeth cleaned by smaller “parasitic” fish species. How to Get There: fly to Denpasar, Bali, and join a dive shop for a day trip from Bali, or take a speed boat to Nusa Penida if you want to stay a few days to explore the island. With its dragons and superb marine life, Komodo national park is definitively a go-to destination for explorers. Mantas are very frequently sighted in Komodo. Between manta dives, you’ll be able to see much more: spectacular macro life, sharks, and a lot of life! How to Get There: fly to Denpasar(DPS) in Bali and embark on a cruise to Komodo. Or take an hour and a half flight from Denpasar to Labuan Bajo on the island of Flores. With over 800 islands sprinkled throughout 12,000 square kilometres of crystalline waters, everything waiting to be discovered! Burma waters only recently opened in 1997 and very few divers have ever been there. One of our favorite sites to see oceanic manta rays - which is the largest species of manta rays - is Black Rock. It’s far into the interior, so you’ll need to book one of the longer cruises (seven or more days). How to Get There: fly to Bangkok or Phuket in Thailand. Then head to Ranong, still in Thailand by plane, train and/or the bus. From there you will embark on the liveaboard. 👉25 dives and 7 nights on a liveaboard starting from 1,750 USD. Off the west coast of Mexico, Socorro or the ‘Revillagigedo archipelago’ is one of the best dive sites in the world to see the larger ‘oceanic mantas’. Curious creatures, as always, they usually come say hello to divers. Oceanic mantas can span as much as nine meters - imagine seeing that! How to Get There: fly to San Juan los Cabos, Baja California, and embark on our liveaboard. You will reach the first dive sites after a 24-hour cruise into the ocean. At the heart of the Coral Triangle, in West Papua, Indonesia, Raja Ampat has some of the most bio-diverse waters in the world: 1427 reef fish, over 600 coral species or 75% of the world’s coral species. You will get a chance to see reef mantas in a few different sites and, if you’re lucky, you might spot oceanic mantas at at the Blue Magic site. How to Get There: Take an international flight to Jakarta or Bali and then fly to Sorong via Manado or Makassar. From there, take a transfer boat to your island or embark on a liveaboard. Last but not least, Cocos Island: with mantas and hammerhead sharks among its frequent visitors, it is among the top-ten dive destinations in the world. This is a trip very experienced divers as currents are usually strong. How to Get There: located 500 km south west of Cabo Blanco, Costa Rica. After flying to San Jose, go to Puntarenas to embark for a 36-hour journey until the first dive. It’s quite a journey…and this is why the marine life is exceptional! Manta rays are incredibly intelligent and often near you to get a close look. However, it’s important to follow a few rules when interacting with them to ensure a positive experience for both you and the rays. Please read and follow the code of conduct for diving with manta rays which we’ve re-published from one of our partners, the Marine Megafauna Foundation.